I am happy to welcome Jeff Johnson to the blog. Jeff has been the primary teaching elder at Grace Bible Church in Conway, Arkansas, for the last 11 years, and he and his wife, Letha, have a son named Martyn. Jeff graduated from Central Baptist College with a B.S. in Bible and earned his M.Rel. in Biblical Studies and a Th.D. in Systematics from Veritas Theological Seminary. Jeff is also the author of The Fatal Flaw of the Theology Behind Infant Baptism (perhaps the single best book on the issue from a Reformed Baptist perspective, in my opinion) and the forthcoming books Behind the Bible: Introduction to Textual Criticism and The Church: The Nature, Purpose, Functions, Worship, Membership, Discipline and Authority of the Local Church. I look forward to any future contributions Jeff may wish to make to the blog. Why was Jesus to be a man familiar with sorrow and grief? Why was He to experience what we would call depression? Because He was to carry our sorrows and griefs. It was a part of His role as our Great High Priest who would offer Himself for our sins. But this means that depression was a part of God's plan for Jesus all along, doesn't it? And I would submit to you that the same may be true for some of us as well. A thorough search of the medical literature demonstrates that such a condition, while admittedly rare, does occur in humans. Commonly referred to as hematidrosis or hemohidrosis (Allen, 1967, pp. 745-747), this condition results in the excretion of blood or blood pigment in the sweat. Under conditions of great emotional stress, tiny capillaries in the sweat glands can rupture (Lumpkin, 1978), thus mixing blood with perspiration. This condition has been reported in extreme instances of stress (see Sutton, 1956, pp. 1393-1394). During the waning years of the twentieth century, 76 cases of hematidrosis were studied and classified into categories according to causative factors: “Acute fear and intense mental contemplation were found to be the most frequent inciting causes” (Holoubek and Holoubek, 1996). While the extent of blood loss generally is minimal, hematidrosis also results in the skin becoming extremely tender and fragile (Barber, 1953, pp. 74-75; Lumpkin, 1978), which would have made Christ’s pending physical insults even more painful. Now, back in Matthew 26, notice also that when Jesus asked Peter, James, and John to stay and watch with Him, He expected that they would stay alert and be in prayer, not only for Him but also for themselves (vs. 41). Sadly, they let Him down in this instance, which may actually have added to the depth of sorrow He felt. But this didn't stop Him sharing His struggle with them anyway. But do we share our depression with others? Some of us do, but in my experience many of those who struggle most with depression never talk about it with their brothers and sisters in the Lord. I think Jesus would counsel us to do otherwise. To be sure, some of them will fail to understand and will let us down, as Jesus' disciples failed to understand Him and let Him down. But there will be those by the grace of God who will listen and who will pray for us faithfully, and we need them! Second, Jesus prayed about what was causing His depression. In this case it was the task that the Father had given him to do, involving His coming death on the cross, which He refers to here as “this cup,” that was leading to His deep sorrow. Here are a couple of other – albeit secondary – reasons for Jesus' sorrow, namely that His closest friends failed Him in this trial (as we have already seen), and that He knew He was also going to be betrayed by one close to Him (and such betrayal is never an easy thing to endure). But notice also that Jesus persisted in prayer because He had complete trust in the Father's sovereign will. This can be seen in the way that He prayed three times that the Father might let this cup pass from Him but all three times declared basically the same thing, “nevertheless, not as I will, but as You will” (vs. 39, 42, 44). This was a key to His overcoming the depression and anguish that could have paralyzed Him. I think it is important to remember that, although we see in Gethsemane the culmination of the sorrow Jesus felt when facing death on the cross for our sins, He was always aware that he was going to face this. It was, then, a sorrow that He carried throughout his life and ministry, not to mention the many others sorrows of life He had to face. But it was not a sorrow that robbed Him of the joy He had in looking forward to the experience of the glory He had with the Father even before the world was created and the joy He had in doing the Father's will. Jesus always obeyed the Father's will, including when He died on the cross, and He did so because He knew there was something that made it all worthwhile. And this is one reason why the author of Hebrews wants us to look to Jesus in His sufferings whenever we are being overwhelmed with our own trials. But this means that we need to constantly turn to Scripture and listen to what God says to us there about Jesus' gracious work on our behalf. Listening sounds passive, but it is hard work. The book of James reminds us that we are prone to “merely listen,” like people who look at ourselves in a mirror and quickly forget what we look like. So when you read or hear about truth and love, don’t just merely listen; really hear. What will you hear? When the triune God speaks, He inevitably talks about Jesus. Jesus is the one who had compassion on those who suffer, and He understands those who suffer because His pain exceeded our own. Have you ever noticed that when you listen to someone else’s suffering, especially if that suffering was overwhelming and intense, your own troubles seem lighter? At least, such listening diverts attention away from our own suffering, and we see that we are not alone. This is what happens when you look toward Jesus and listen. What do we hear from these passages we have examined about Jesus? We hear that He moved through His sorrow and anguish by trusting His Father and by keeping His mind focused upon the joy set before Him. Jesus did not sinfully react to the things which brought on depression, and He did not allow these things to paralyze Him or rob Him of the joy He had in His relationship with the Father and in doing the Father's will. He trusted in the Father's love and in the Father's will, and it made all the difference. Indeed, I think He shows us that it is perfectly possible through faith to have joy in the midst of sorrow or pain. And I think any contemplative believer knows this deep in his heart. But we will come back to this idea later, when we examine some of the Biblical teaching about joy. NKJ Ephesians 5:22-24 "Wives, submit to your own husbands, as to the Lord. 23 For the husband is head of the wife, as also Christ is head of the church; and He is the Savior of the body. 24 Therefore, just as the church is subject to Christ, so let the wives be to their own husbands in everything." NKJ 1 Peter 3:1-6 "Wives, likewise, be submissive to your own husbands, that even if some do not obey the word, they, without a word, may be won by the conduct of their wives, 2 when they observe your chaste conduct accompanied by fear. 3 Do not let your adornment be merely outward-- arranging the hair, wearing gold, or putting on fine apparel -- 4 rather let it be the hidden person of the heart, with the incorruptible beauty of a gentle and quiet spirit, which is very precious in the sight of God. 5 For in this manner, in former times, the holy women who trusted in God also adorned themselves, being submissive to their own husbands, 6 as Sarah obeyed Abraham, calling him lord, whose daughters you are if you do good and are not afraid with any terror." Given such clear teaching of Scripture, I have to agree that Michele Bachmann should indeed be submissive to her husband. But I wonder why she didn't exactly say that in her response to the question she was asked. I wonder why she instead described her and her husband's idea of submission as a mutual respect between them. After all, wouldn't this sound to the world around her just like their own common understanding of marriage as a mutual partnership with no clear head or leader? And doesn't it sound like she is thus attempting to avoid the connotations of authority that the term submission actually communicates? I certainly think it sounds that way, and I suspect that is precisely why she answered as she did. But of even more concern to me is the matter of why Mrs. Bachmann doesn't actually live out this Scriptural teaching in a consistent way. After all, how could she possibly live in submission to her husband and still be in authority over him as President of the United States? As I see it, there is no possible way she could do so, and I think the reporter who asked her the question was perceptive in seeking to highlight this very issue. In addition, I see no way that Mrs. Bachmann could possibly continue to run for public office amid the whirlwind of media frenzy and so much opposition and heated debate and still maintain what Peter described as "a gentle and quiet spirit." This leads me to think that Mrs. Bachmann could do far more good to publicly recant her words, bow out of the race for public office, resign her place in the House of Representatives, and explain that she is doing so in submission not to her husband, but to Christ. In doing so, she too could find her place alongside Sarah as a truly godly example to women everywhere (1 Pet. 3:6). Note: Although the author of Lamentations is not given in the text, the book has traditionally been attributed to the prophet Jeremiah. Since I see no good reason not to accept this traditional view, I will assume in this post that Jeremiah is indeed the author. However, nothing I will address here will be affected by this issue. 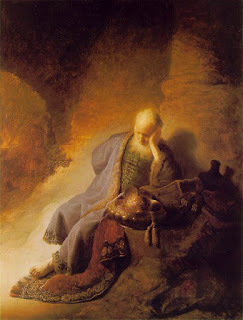 Notice how Jeremiah has begun to think that God is not hearing his prayers any more. This is a fairly common thing for depressed people, and it is one of the reasons they often quit praying. But it isn't true that He has stopped listening, as Jeremiah will later indicate. Notice how Jeremiah continues the description of the terrible things he has endured by explaining them as being done ultimately by God. He knows not only that it is God who has brought destruction upon Jerusalem, but also that it is God who is ultimately sovereign over his own sufferings as well. Even though he, as a true believer, has been spared experiencing God's wrath, it doesn't mean that he has been spared suffering as part of God's plan for his life. And we shall not be spared suffering either. Remember, for example, Paul's words that “the Spirit Himself bears witness with our spirit that we are children of God, and if children, then heirs – heirs of God and joint heirs with Christ, if indeed we suffer with Him, that we may also be glorified together” (Romans 8:16-17). Notice here that Jeremiah changes from speaking of God in the third person to addressing Him directly in the second person. He is talking to God now, and it will begin to change his point of view. Still speaking to God, Jeremiah tells Him about how far into depression he has sunk, to the point where he feels completely helpless and completely hopeless. And he simply cannot forget the horrors he has witnessed and the sufferings he has personally experienced. In fact, he apparently keeps reliving it over and over again, and he keeps feeling helpless and hopeless over and over again. In our day, at the very least he would probably be diagnosed with Post Traumatic Stress Disorder. It is depressing for us just to think about what he went through! We can only imagine how bad it was for him! But as bad as it was, Jeremiah has more to say, and it may shock some of us. Now, when he says, “this I recall to my mind, therefore I have hope,” he cannot mean the things he has been remembering up to this point, because these things led him to feel hopeless. He must, then, be introducing a new line of thought, one that does give him hope. Let us see what we find, then, in the following verses. Notice how he remembers what he knows to be true about God, despite the circumstances he has endured and cannot put from his mind. And notice how he shifts from remembering God's mercy and compassion to praising Him for His faithfulness. You see, as real as his suffering was, it didn't eclipse in his mind the reality of who God is! But he doesn't just speak to God and praise Him for His faithfulness, he also speaks to himself in the next verse. Jeremiah reminds himself that God really is enough for him. In fact, one gets the impression that had he not been brought so low he may not have realized this fact so clearly as he does at this moment. Isn't it true that we often don't see that God really is enough for us until He strips away everything else that we may have been hoping in? And isn't it good for us when He does this? Jeremiah thought so, as the next couple of verses demonstrate. These words are spoken by a man who had no other choice but to wait upon the Lord, and he has gone from thinking God never hears his prayers (vs. 8 above) to a calm assurance that He does hear the one who waits upon Him and does not quit seeking Him, no matter what the circumstances. In fact, Jeremiah says it is good that we should be put in the very kind of situations that require us to wait for God and to seek Him earnestly, situations that bring us to the very end of ourselves and make us wonder if there is any hope at all. Only then we will truly know the Hope of the hopeless. What about you and I? Do we really want to know God as Jeremiah knew Him? Do we really want to experience how good it truly is to have to wait upon Him and desperately seek after Him? Well, then, perhaps we should expect some very difficult and depressing circumstances to be a part of His plan for us. And perhaps we should not be surprised if He asks us to endure a great deal of heartache. In addition, if we really want to be used of God as men like Jeremiah, David, and Moses were, then perhaps we should be willing to suffer as they did as well. After all, the lives of these men are still speaking to us today for a reason!